The 2009 Alumnae race was a treat. 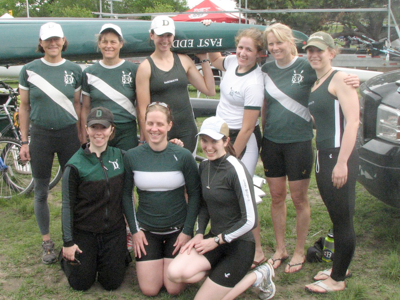 From bow to stern, the following alums competed: Kelli '07, Jill '03, Nancy '77, Nicole '08, Heather '00, Kate '07, Carlie '80, Judy '75 (and myself, a '00 as cox) giving us a span of 33 years of Dartmouth history! The Geer sisters in the stern pair led us strong off the line from which we settled into a base of a 32 for the race. Brown and Radcliffe took about a half a length off the start and we took the same (and more) on Syracuse, Penn and Georgetown. We kept walking out on those crews while also holding Brown and Radcliffe at about a length through the 1000m mark. In Dartmouth style, we put a bigger move on in the third 500 to take more open water on Syracuse, Penn and Georgetown and hold Brown and Radcliffe as tight as possible. In the last 500, we couldn't hold the youngins in the Brown and Radcliffe boats and allowed them to break out some open water but were excited to take home a decisive third place. A great part of the day was seeing Dartmouth step back into a solid contender in the Grand Finals. Watching Dartmouth almost take down Brown in the V8 event was something that seemed almost impossible in years past. As a former HS coach, I've witnessed the clear edge that Yale, Princeton and Brown have in the recruiting process. To see Dartmouth come this close to those schools was impressive and made me want to know what I could do to push the program even closer to the medals dock. The other exciting piece of the day was the rowing power present in our alums. From former Olympians to being a part of the Concept2 and Vespoli families, Dartmouth has a clear presence in the rowing world. A few of my high school athletes were present and as 16 and 17 year olds they were quite excited to meet the Geer sisters and listen to them speak of their experience with the boycotted Olympics. All in all, the day was a fabulous one and I hope to see even more alums at the next one.